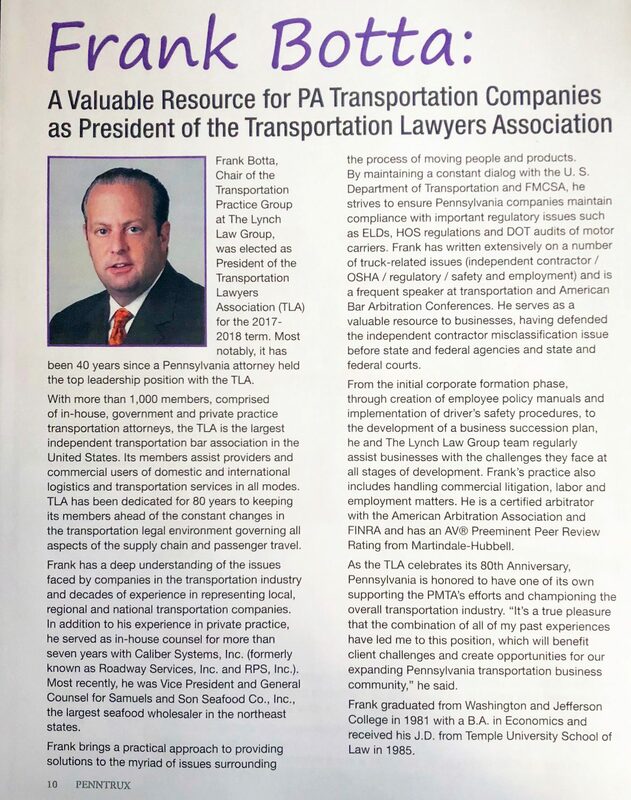 Frank Botta, who leads The Lynch Law Group’s Transportation Practice, was featured in the January 2018 issue of PennTrux, the official magazine of The Pennsylvania Motor Truck Association (PMTA). Botta has vast experience assisting companies in the transportation and logistics industry. In addition, he is immersed in the Transportation Lawyers Association (TLA), where he has been an active and contributing member for many years. Botta is the current President of the TLA, which is the largest independent transportation bar association in the United States. The organization has more than 1,000 members, comprised of in-house, government and private practice transportation attorneys, who assist providers and commercial users of domestic and international logistics and transportation services. He has served in this role since May 2017 and will continue through May of this year. The TLA is celebrating its 80th Anniversary this year. It has been 40 years since a Pennsylvania attorney has held the TLA’s top leadership position. Through his role with the TLA, in combination with decades of experience in the transportation industry, Frank serves as a valuable resource to Pennsylvania’s transportation and logistics companies. “It’s a true pleasure that the combination of all of my past experiences have led me to this position, which will benefit client challenges and create opportunities for our expanding Pennsylvania transportation business community,” he said. Click here to read the full article from PennTrux. More information about the PMTA can be found on the website. Information on the Transportation Lawyers Association can be found on its website. 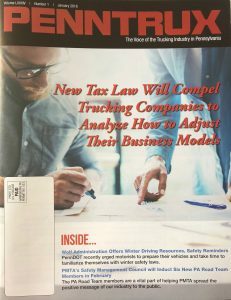 This entry was posted in Legal Watch, Transportation and tagged Trucking Industry, TLA, Transportation, Botta, PMTA. Bookmark the permalink.